Troubled by the inconsistencies in the ideology of the Roman Catholic Church, Saint Thomas Aquinas sought to raise the level of theological debate through logic.. Seven centuries later despite the flaws in his argument, Aquinas’ postulation that God was The First to push, which cosmologically states that everything that moves must have had something push it and in turn that thing pushes another and so on. The question would further develop from there and is still studied in contemporary books on theoretical physics, meta physics and or philosophy, which is if God created the universe did God have a choice? There is a fringe area in science where the esoteric and the scientific coexist comfortably, especially when one considers regardless of how one interprets God, Theoretical Physicists have long stated that their ultimate goal is to know the mind of God. This question is something that has personally interested me from both a layperson’s perspective and a creative writer’s perception for a long time and it is part of the tapestry of my 2016 science fiction novella, First Mover. First Maker. I find that Auteur Darren Aronofsky’s work often deals with similar esoteric themes that call into question the nature of our being whether it is in his feature film debut Pi or in other films he has directed like The Tree Of Life, Noah, and now most recently with his feature film mother! I would even state that some of his more grounded films like Requiem For A Dream could be looked upon in a similar way even though there are no overt supernatural occurrences in his adaptation of Hubert Selby’s acclaimed novel. However whether it is the Beat Generation Authors and Playwrights or established contemporary filmmakers and storytellers like Darren Aronofsky, a film that presents a point of view that combines elements of Judeo-Christian esotericism with contemporary vision and then sets it within an Octagonal House seemingly isolated from the world and yet encompassing it in total, I like a film that does not give me all the answers, but instead offers the viewer multiple interpretations on what is going on and what is the filmmaker trying to tell us? While some answers may seem more plausible than others, there are not necessarily any right or wrong answers because sometimes the Artist knows not why the Artist does what the Artist does, but the Artist’s work speaks it’s own words based upon the interpretation of the beholder. So I see in it the question Saint Thomas Aquinas asked and have one interpretation, but my perception is neither the only way one can look at mother! nor is it right or wrong either. I could discuss this film for hours and I am sure many have and will do so in the future, but ultimately I feel the viewer should enter this film knowing as little as possible so they can take in the experience for themselves and that is why I will not discuss any story points in this review beyond what I have detailed above. You have to see this film for yourself. 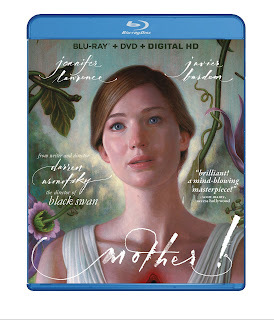 Paramount Home Entertainment’s Blu-ray Disc edition features a beautiful AVC encoded 1080p/24fps high definition presentation depending upon the users own viewing equipment and couples is with an enveloping English Dolby ATMOS Soundtrack that is backwardly compatible with Dolby TrueHD Systems too. A standard definition 16 by 9 enhanced version of the film is included within the two-disc Blue BD case. Both the Blu-ray Disc and DVD versions feature an English Descriptive Audio Track that narrates the action for the visually impaired as well as French and Spanish Language Dolby Digital 5.1 Surround Soundtracks along with English Subtitles for the Deaf and Hearing Impaired as well as French and Spanish Language Subtitles encoded as options. The Blu-ray Disc also features standard English Subtitles and a Portuguese Language Dolby Digital 5.1 Surround Soundtrack and optional Portuguese Language Subtitles too. Within the BD case is an insert with a limited time only redeemable code for a Digital Copy for either i’Tunes or Ultraviolet users. The Blu-ray Disc also includes a documentary detailing the making of the film with extensive high definition behind-the-scenes footage and interviews (29:51) and the makeup effects (6:45) detailing the animatronics creations made for the film too. The interactive menus are all well rendered and easy to navigate. mother! will debut on Blu-ray Disc, 4K Ultra High Definition Blu-ray Disc combo packs and standard definition DVD sold separately on Tuesday December 19, 2017 at retailers on and offline courtesy of Paramount Home Entertainment.